Blog to End the Occupation: Celebrate Stolen Beauty Campaign! 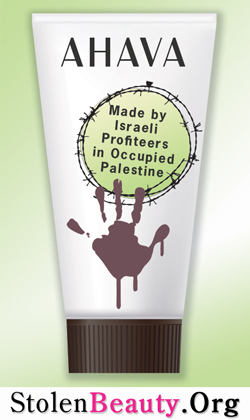 Our member group CODEPINK is celebrating the three-year anniversary of its Stolen Beauty Ahava boycott campaign. Although Ahva labels it beauty products as "Made in Israel," the ugly truth is that the products actually come from stolen Palestinian natural resources in the occupied West Bank and are produced in the illegal settlement of Mitzpe Shalem. This mislabeling has been in the news recently as both South Africa and Denmark recently decided to clearly label settlement goods.